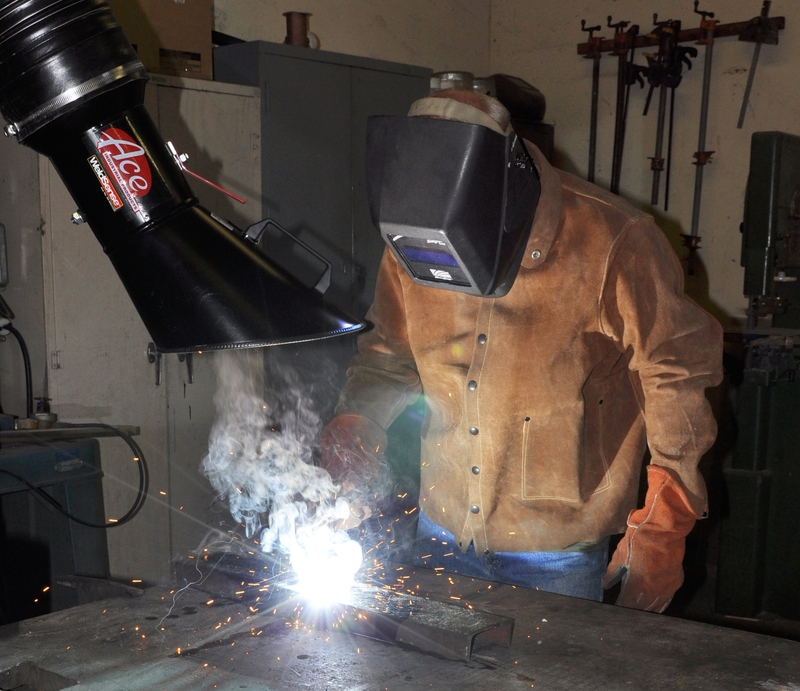 Welding fume extraction hoods should be placed close enough to the welding arc to be effective, yet not so close as to distrub shielding gases or obstruct the welders line of vision. We call the optimal distance from the arc the sweet spot, and the sweet spot is determined by placing the edge of the extractor hood approximately the length or diameter of the hood from the arc source. For example, when using Ace portable extractors, which employ 10 inch hoods, the sweet spot would be approximately 10 inches from the arc source. Slight adjustments may be needed, but 10 inches should be a good and effective starting point. To mitigate the possibility of any vision obstruction, Ace fume extraction hoods are designed to be effective when placed at about a 45 degree angle relative to the welding surface. Positioned in this manner, the hood pulls fumes from the top and the side of the arc while being angles away from the welder. The following photo demonstrates the proper hood position that is both effective and unobtrusive.